Fig. 1. Four Gospels. Fragment. 11th/12th cent. Repaired in 1262 by Barcel. 129 fols., 28,5х22,5 cm. Parchment. Rectangular Erkatagir (or "ironclad letters") script. Initials. Fig. 2. 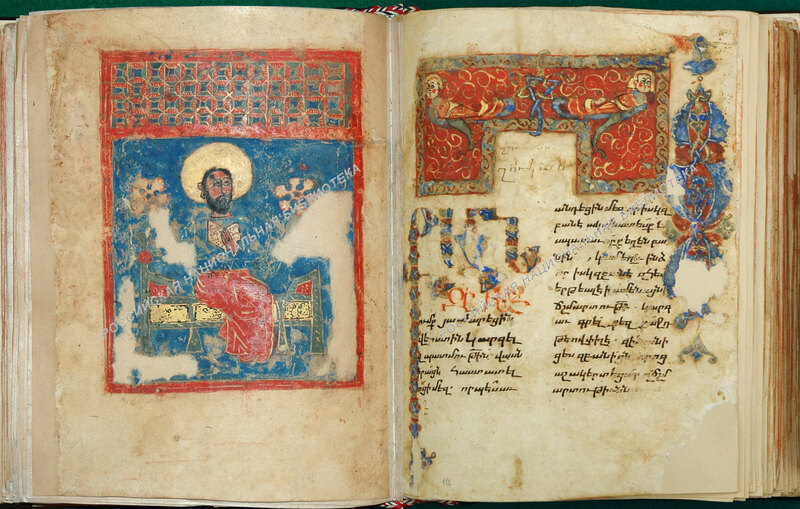 Gospel of John. Fragment. One parchment leaf folded in half, cut and used for protective sheets covering the binding of the later manuscript. 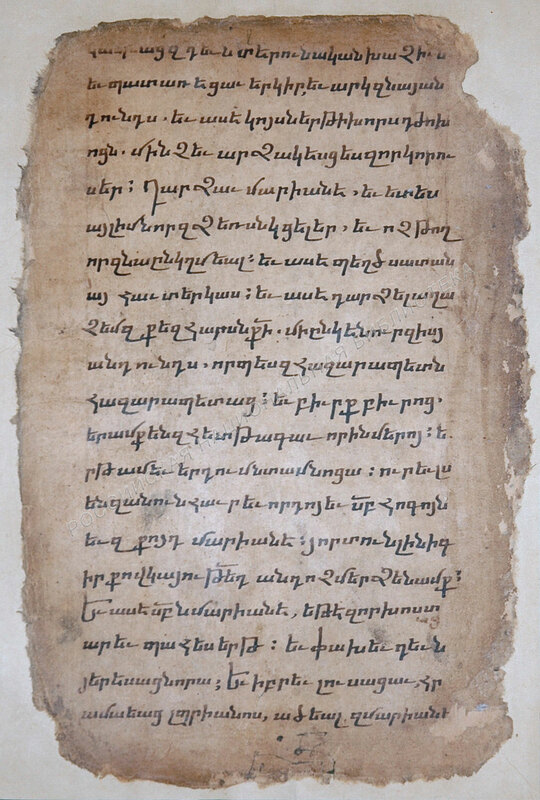 Erkatagir (or "ironclad letters") script. Fig. 3. Life of St. Marina. Fragment. 2 fols. 24,5х16,3 cm. Paper. Bolorgir (or "cursive") script with with elements of Majuscule writing. Arm. 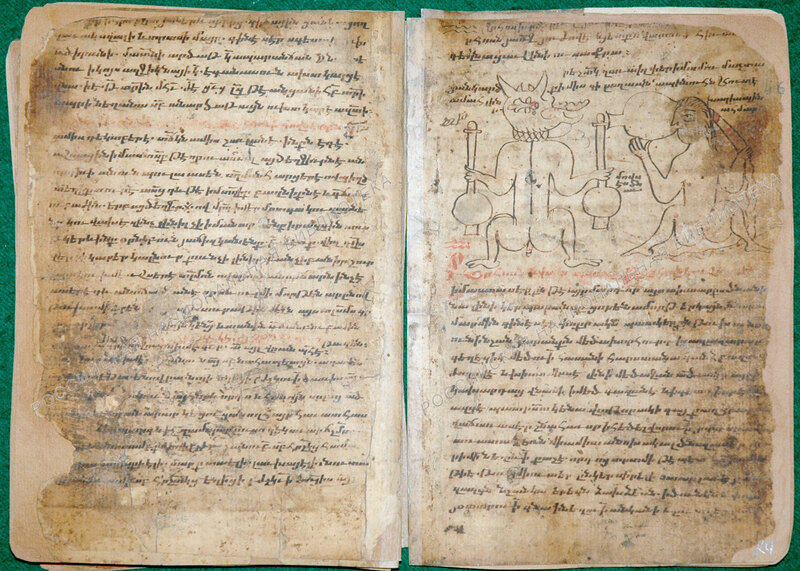 n. s. 23, fol. 1v. 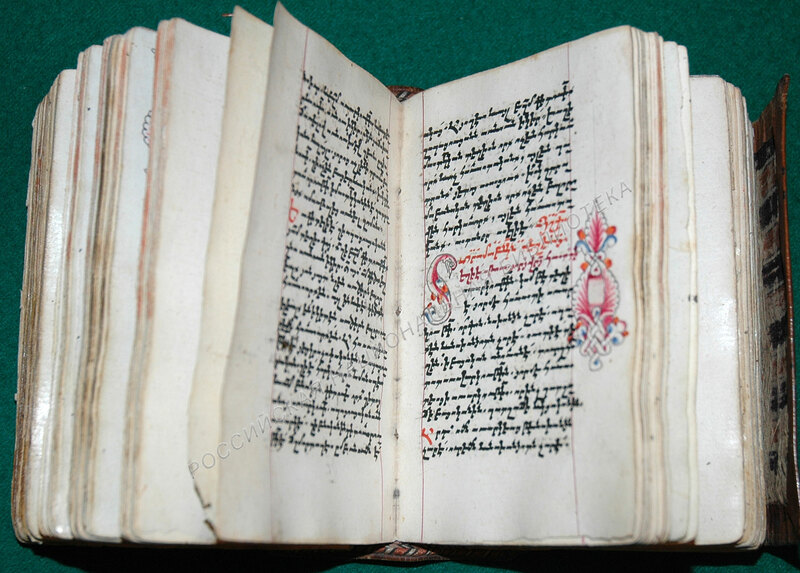 1319, Nakhichevan. The scribe Hovseb, bookbinder Johann. 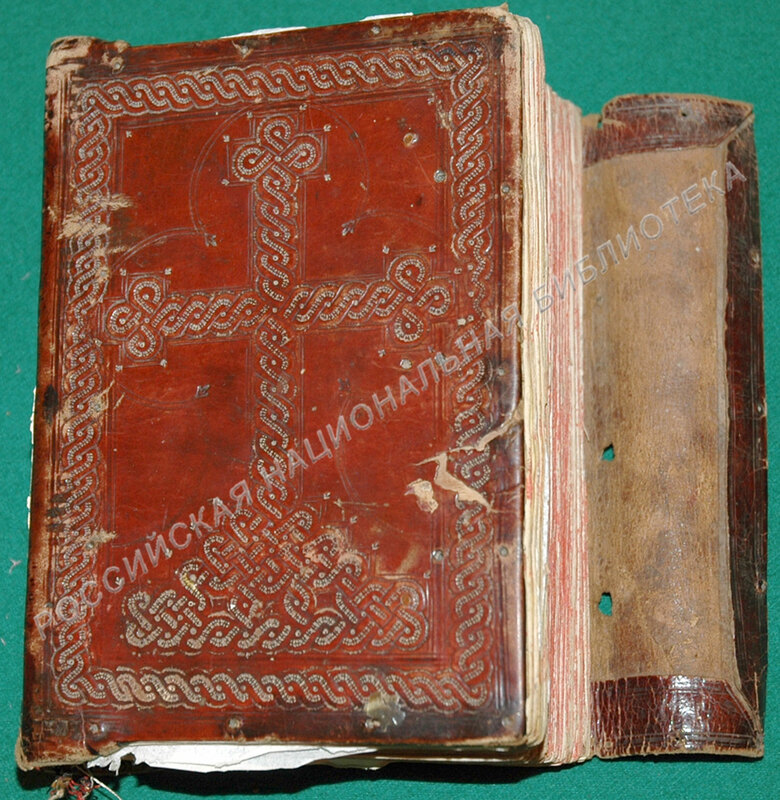 Repaired and re-bound in 1677 by the bookbinder Vlas. 242 fols. 30х23 cm. Paper. Bolorgir (or "cursive") script. Miniatures, headpieces, initials. Arm. n. s. 48, fol. 111v.–112. In the collection dating from 1404 1404. 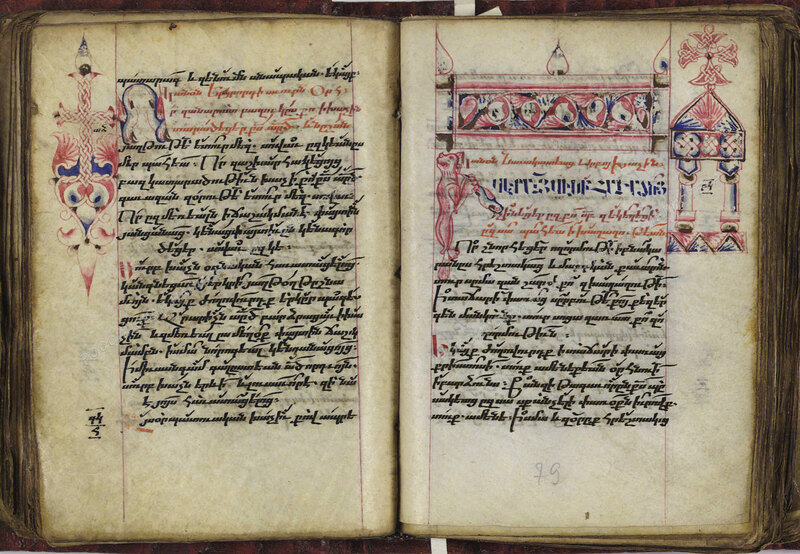 Scribe Tuma. 77 fols. 18,3х13,8 cm. Paper. Bolorgir (or "cursive") script. Arm. 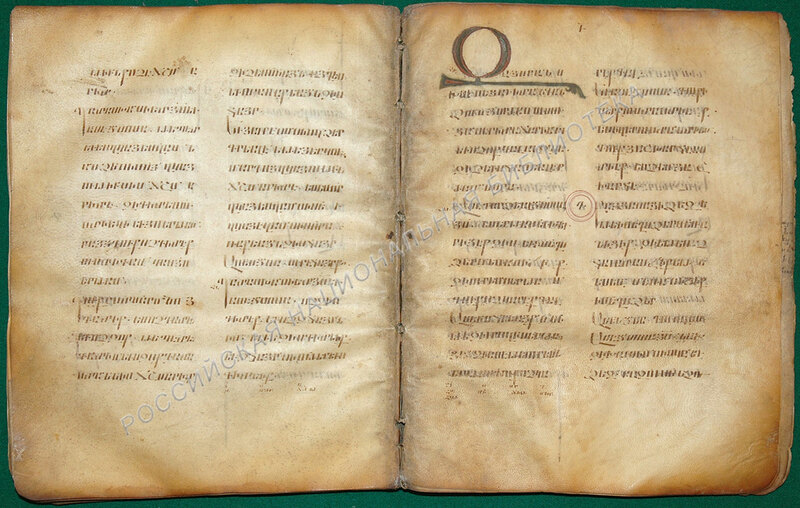 n. s. 39, fol. 1v. Fig. 6. 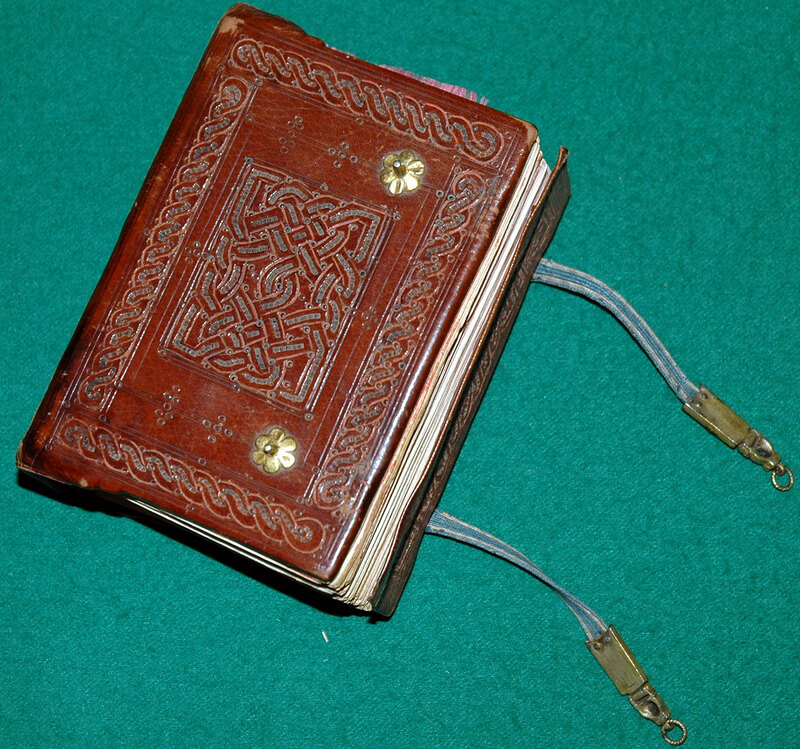 The book containing the Psalms, the Book of Hours, and several educational texts. 1554, Maras. 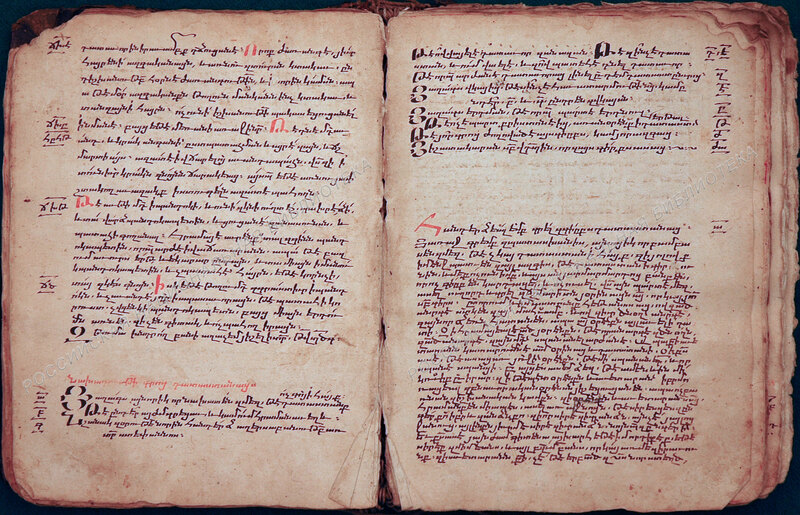 The scribe Stepannos. 254 fols. 20,5х15,5 cm. Parchment. Bolorgir (or "cursive") script. Headpieces, initials. Palimpsest (written on the leaf from which the text of an unknown content has been washed off). Arm. 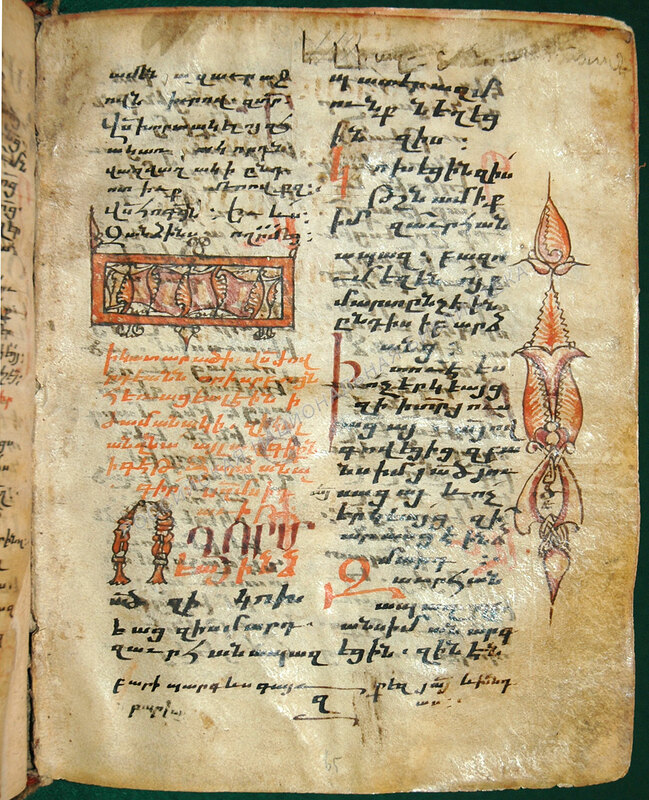 n. s. 14, fol. 65. 141 fols. 31х19,5 cm. Paper. Notrgir (or "minuscule") script. 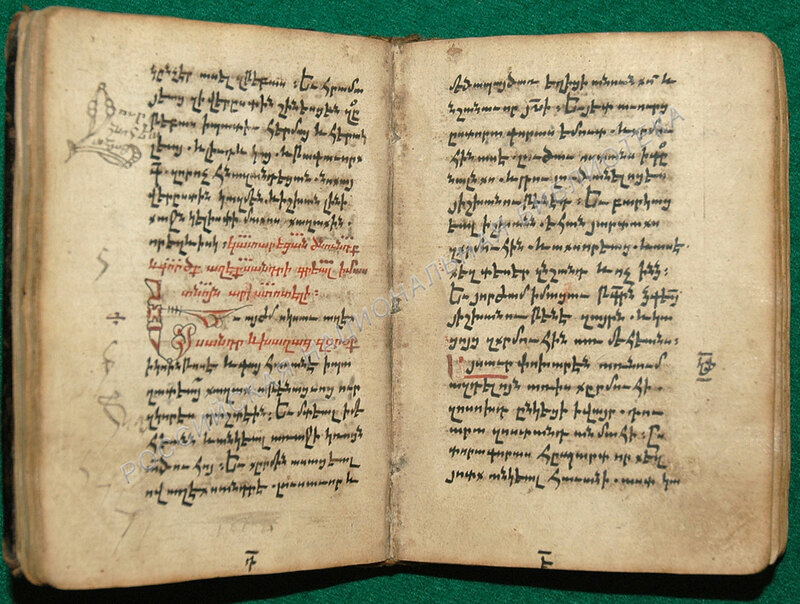 All text is written in Armenan script, there are Polish words in translations of Armenian words. Acquired in 1891. Arrived from Kamenetz-Podolsk Church of St. Nicholas. Fig. 8. Collected geographical and astronomical works. 127 fols. 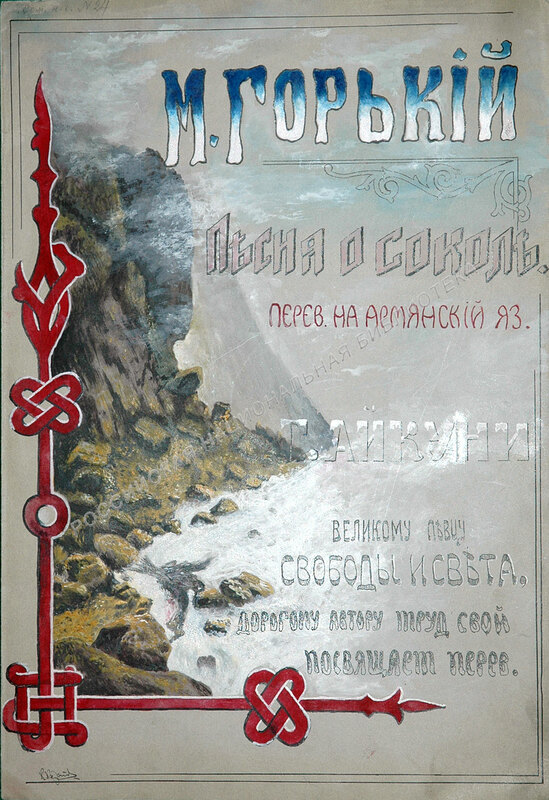 20х14,5 cm. Paper. Bolorgir (or "cursive") script. Drawings in ink. 1635, Balesh (Bitlis, Turkey). Scrib and artist Sahak(Isaac) Balishetsi. Commissioned by Mariam. 292 fols. 16,2х11,5 cm. Parchment. Bolorgir (or "cursive") script. Miniatures, headpieces, initials. 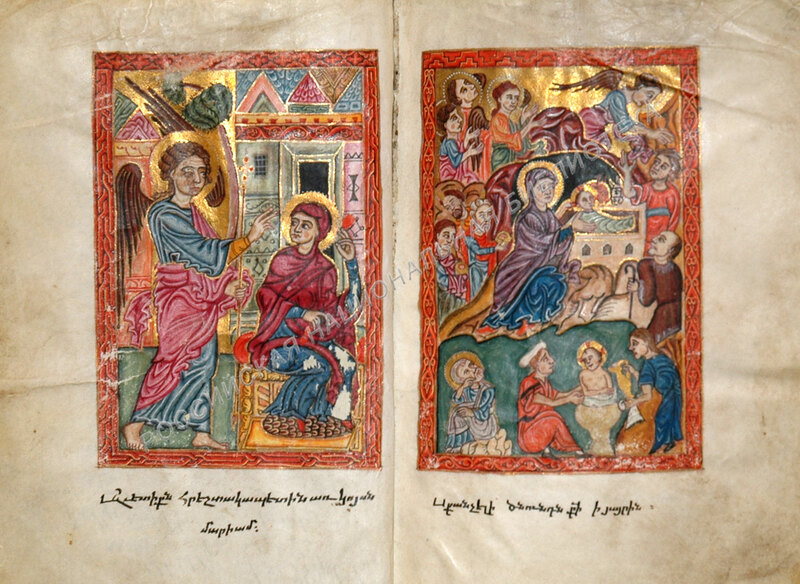 Miniatures «Annunciation» and «Nativity of Christ». 1645, Kaffe (Feodosiya). Scrib, artist and binder Nikolaos. 402 fols. 13,7х9,7 cm. Parchment. Bolorgir (or "cursive") script. Miniatures, headpieces, initials. 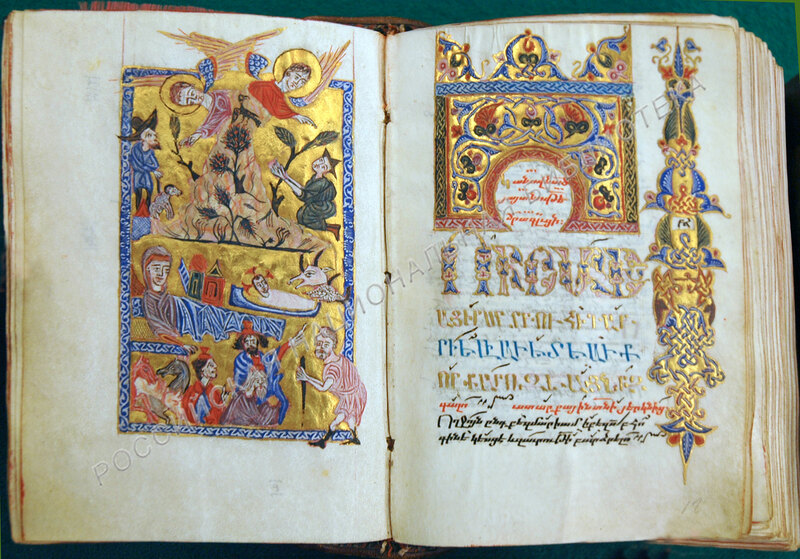 Miniature «Nativity of Christ» and the begginning of the text with headpiece. 200 fols. 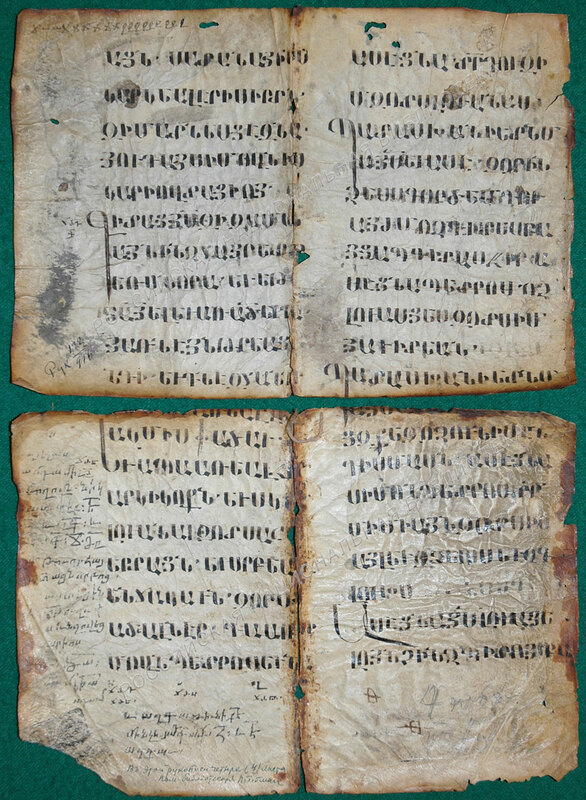 12,5х8,5 cm. Parchment. Bolorgir (or "cursive") script. Headpieces and initials. 155 fols. 13,5х9,7 cm. Paper. Notrgir (or "minuscule"). Fig. 16. 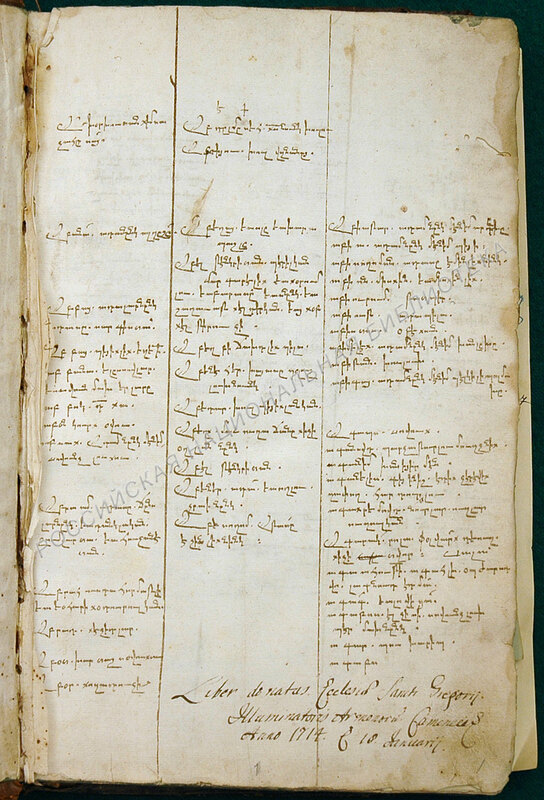 Collected treatises on logic and grammar. 1693, Shosh. Scrib Astvatsatur Fakhrapattsi. 373 fols. 15х10,5 cm. Paper. 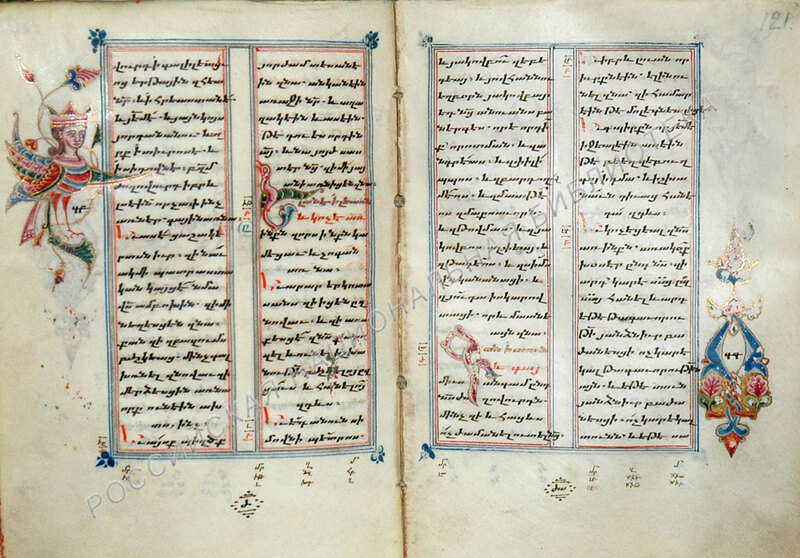 Notrgir (or "minuscule"). 144 fols. 20,7х16,5 cm. Paper. Cursive writing. Acquired in 1950. Letter of appreciation to General Pavel Suhtelen. 1 fol. 42х25,5 cm. Paper. Cursive writing. Headpiece. 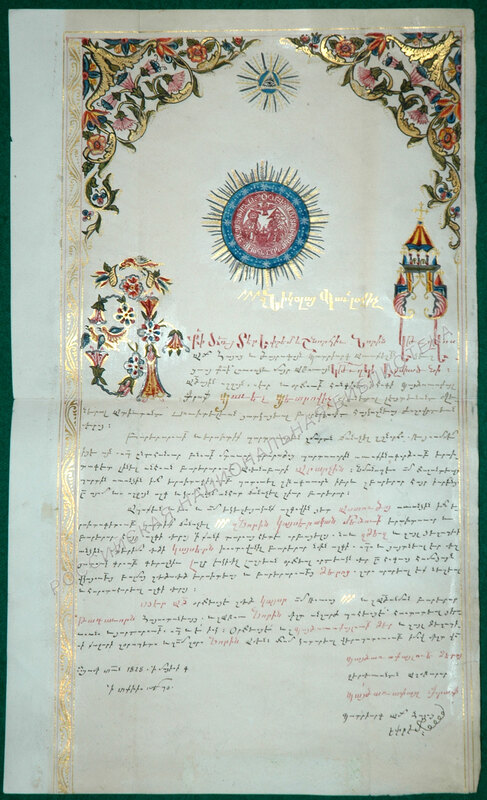 Acquired in 1837. (In P. Suhtelen's collection). Song of the Falcon. 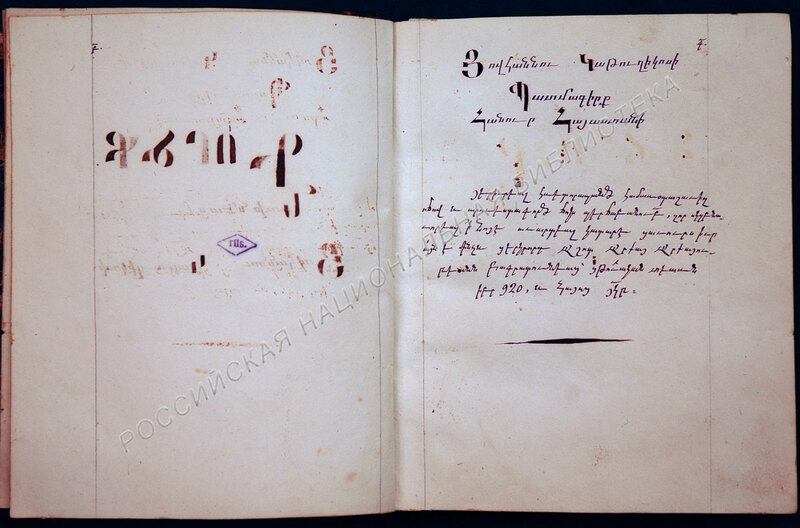 Translation into Armenian by G. Aykuni. 2 fols. 35,3х24,5 cm. Paper. Drawing in colours. Acquired in 1919. (Donated by M. Gorky).